I love love love this packaging! The frosted overlay on top of metallic bronze-orange is so summery - it reminded me, randomly, of those Ban de Soleil commercials from the 80's. There's nice sized mirror inside the palette and the fairly compact size of the palette makes it a great travel companion. The shades inside are fairly warm leaning. The first shade being the coolest, and the two deeper shades being a touch warmer. The finish of these is a wet type of foiled look, and they can also be used wet. When I first tried it with some Fix +, I really didn't see much difference in intensity. 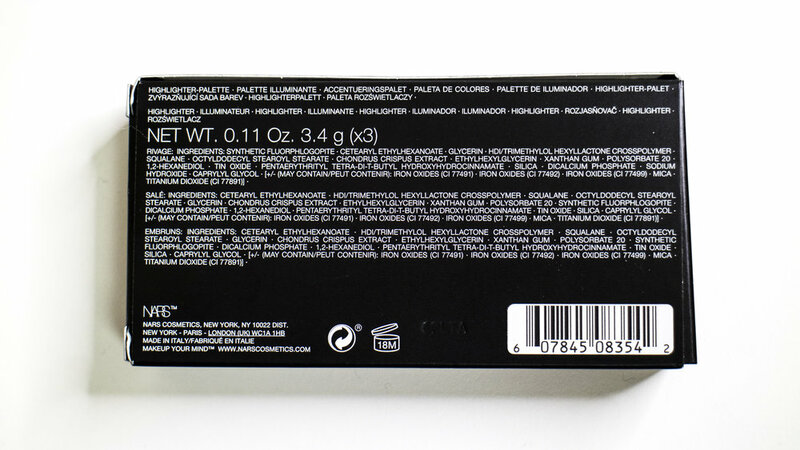 The description on the Sephora site also mentions using it on the eyes, and I can see the first shade being a lovely inner corner highlight, or brow bone highlight. For my skin tone, I can say realistically that I'll be able to use the first two shades easily. I could probably mix the deepest shade, Embruns with the first, or use it on my eyes. And for reference, the Hot Sand shade falls between the two deeper shades.